Oceania Cruises have been designed for people with an insatiable appetite for the finer things in life, with a particular emphasis on fine dining. Guests embarking on any of the Oceania Cruises will savour the world’s finest culinary experience while enjoying breath-taking views of the sea (and things just got better!). Imagine a week at sea with a celebrity chef and foodie? Um, all we need is a bikini and our IPhone for the perfect Instagram. 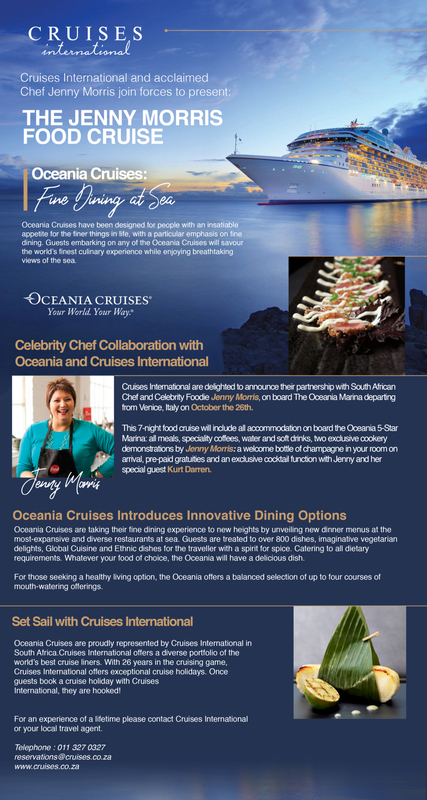 Cruises International are delighted to announce their partnership with South African Chef and Celebrity Foodie Jenny Morris, on board The Oceania Marina departing from Venice, Italy on October the 26th. This 7-night food cruise will include all accommodation on board the Oceania 5-Star Marina: all meals, specialty coffees, water and soft drinks, two exclusive cookery demonstrations by Jenny Morris, a welcome bottle of champagne in your room on arrival, pre-paid gratuities and an exclusive cocktail function with Jenny and her special guest Kurt Darren. 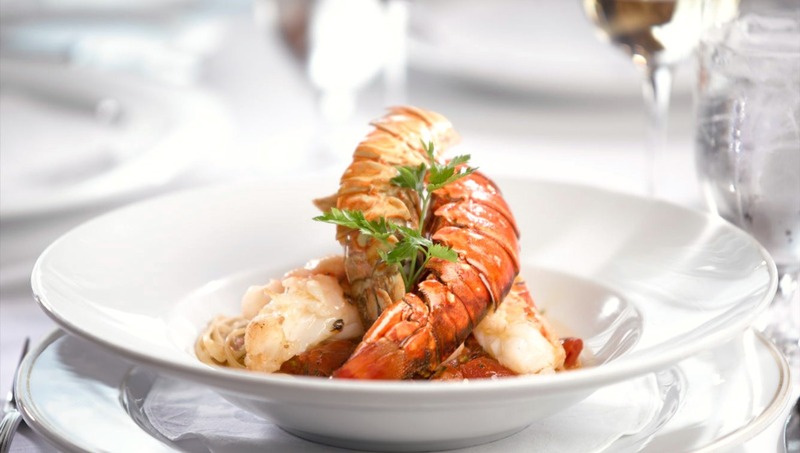 You will experience culinary delight in the following destinations: Venice, Italy; Ravenna, Italy; Zadar, Croatia; Kotor, Montenegro; Corfu, Greece; Messina, Sicily; Naples, Italy; Rome, Italy. Oceania Cruises are taking their fine dining experience to new heights by unveiling new dinner menus at the most-expansive and diverse restaurants at sea. Guests are treated to over 800 dishes, imaginative vegetarian delights, Global Cuisine and Ethnic dishes for the traveler with a spirit for spice. Catering to all dietary requirements. Whatever your food of choice, the Oceania will have a delicious dish. For those seeking a healthy living option, the Oceania offers a balanced selection of up to four courses of mouth-watering offerings. Oceania Cruises are proudly represented by Cruises International in South Africa. Cruises International offers a diverse portfolio of the world’s best cruise liners. With 26 years in the cruising game, Cruises International offers exceptional cruise holidays. Once guests book a cruise holiday with Cruises International, they are hooked! For an experience of a lifetime please contact Cruises International or your local travel agent.